The Ombudsperson is independent in structure, function and appearance to the highest degree possible within the organization. All communications with those seeking assistance are held in strict confidence, and confidential information is not disclosed unless given permission. The Ombudsperson advocates for fairness in campus proceedings, policies, practices and operation for all students, faculty and staff. The Ombudsperson, as a designated neutral, remains unaligned and impartial. The Ombudsperson does not engage in any situation could create a conflict of interest. The Ombudsperson does not participate in any formal adjudicative or administrative proceeding related to concerns brought to her attention. Our Ombuds Office is dedicated to excellence in the practice of Ombuds work. The IOA Code of Ethics provides a common set of professional ethical principles to which we adhere: Independence, Neutrality, Confidentiality, Informality and Commitment to Fairness. The Standards of Practice are informed by the Ethical Principles and directly impacted the Terms of Reference of this Ombuds Office. The Student Ombuds Office at Brock is structured as a Tri-funded Model with Brock University Students’ Union (BUSU) funding 70%; Brock University funding 20% and the Graduate Students Associate (GSA) funding 10%. 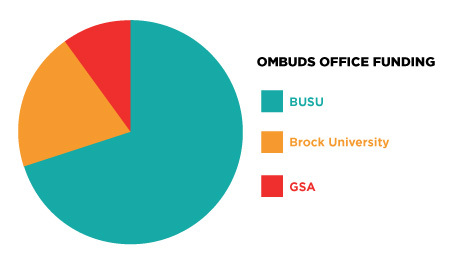 The Ombudsperson is a BUSU employee and is located directly within the BUSU offices. The Student Ombudsperson reports directly to the General Manager of the Organization. The Ombuds Advisory Committee (OAC) meets bi-annually, or as required, to review issues or concerns related to the Ombuds Office/Service and where appropriate, makes recommendations to assist the Ombudsperson in improving the policies, procedures and protocols on campus.